Use “Our Prophets and Apostles Today” to learn about our leaders, including our new prophet and apostles. Cut out the pictures of our prophets and apostles here. Turn to page 24 and match the pictures with the names and facts about each leader. Tape the picture above the name so you can flip the picture up. Set the chart on the floor and take turns tossing a button or coin onto the chart. When the button lands on a picture, lift it up to read about that leader! One way to know Jesus without seeing Him is to “feast” on His words (see 2 Nephi 32:3). That means to really learn and love what He taught. You can feast on this tasty snack too! Be sure to get an adult’s help. In a large bowl, use a beater to mix together the cream cheese, yogurt, sugar, and vanilla. Stir in the fruit, and enjoy! 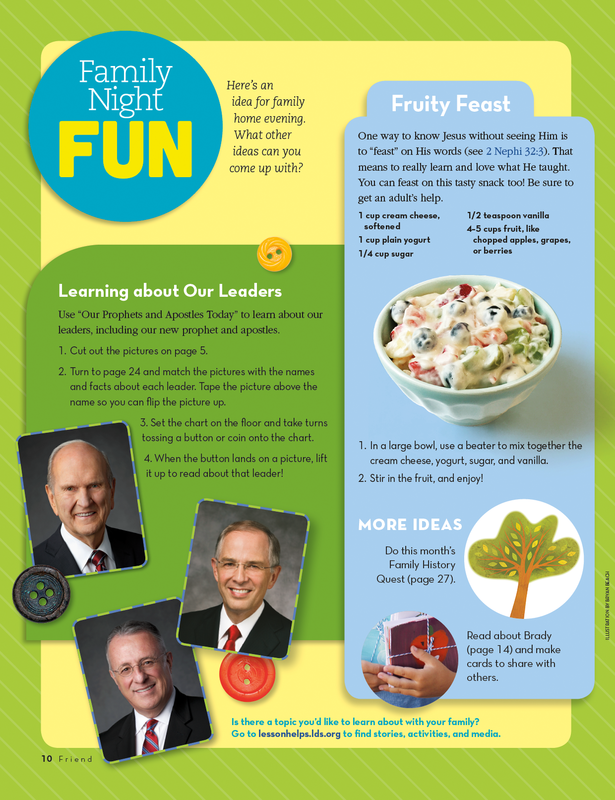 Do this month’s Family History Quest (page 27). Read about Brady (page 14) and make cards to share with others.